Admit it. How many times do you slap your alarm phone, watch, or clock before you actually get up? More than once for sure. But not Catholic family man, former Calvin Klein model (years ago) and one of the highest paid actors in Hollywood, Mark Wahlberg! 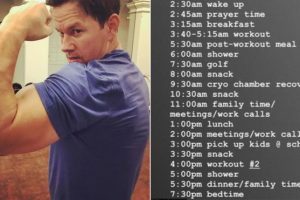 Challenged by a fan who wanted to know his workout schedule, 47-year-old Wahlberg, father of four, delivered details that give us cause to re-think our own schedules, that is, after we’ve recovered our awe-struck jaw drop.